Any Questions? Are there more sugar and carbs in Freeze Dried foods? That’s the beauty of freeze dried food—super sweet with no added sugar! The amount of sugar in a strawberry is the same before and after freeze drying. No more. No less. And all natural baby. Are your foods artificially ripened? Our food is picked at the peak of ripeness from the tree, vine, or ground, gaining more nutrients in those precious last days of ripening5. 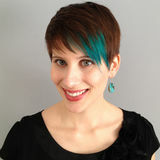 Many grocery store foods are picked early and exposed to toxic ripening agents. Are dehydrated or canned foods as good as freeze dried? Because of the high heat used in canning and dehydrating, loads of nutrients5 are lost. Freeze drying uses very low heat to gently remove the moisture and retain the nutrients. The Nutrilock™ Difference It’s the reason you’re going to fall in love with this food. We promise. ompare a tomato you’ve just plucked off the vine in your garden to the tomato you get from the grocery store in the winter months. The flavor! No comparison, right? Unfortunately, taste is not the only thing lacking in the store tomato. Nutrients! Produce starts losing nutrients soon after being harvested. Thrive Life partners with farmers who make quality food their passion! Don’t be sad. We have a solution. A tasty, beautiful, nutritious solution. We follow strict food safety standards and require all of our farmers and suppliers to do the same. It’s what we call the Nutrilock Difference. Freeze drying gently removes moisture from whole foods and locks in nutrients instead of letting them degrade in a truck or train, or even on the grocery store shelf. •S  ensitive nutrients like Vitamin C, degrade in fresh products over time. Flash freezing followed by freeze drying stops this degradation4. We select products free of artificial colors, flavors, sulfites, MSG, and hydrogenated oils. That stuff is nasty! Our Quality team is very busy. They inspect EVERYTHING coming in AND going out of our plant. We’re all afraid of them. They’re mean, but in a nice way. Our Nutrilock Promise locks in taste and nutrients for a long long time so you don’t have to worry about your food going bad. It’s ready when you are! • Grocery store “fresh” pineapple can be 20 days old, traveling thousands of miles to reach your grocery store shelves. Plant compounds that are super strong antioxidants. Think of them as nature’s defense food. The Nutrilock Difference is simply this: we lock in the taste and nutrients to the food you love, so you’re getting the best that Mother Nature has to offer…every bite. 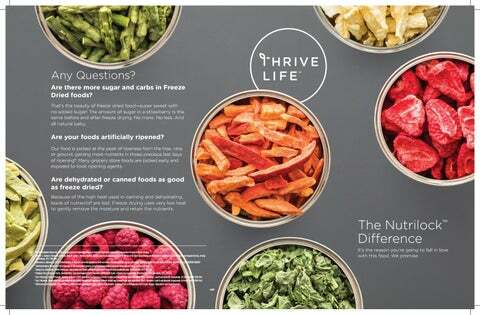 Amazing facts on the nutrition of Thrive Life freeze dried food!